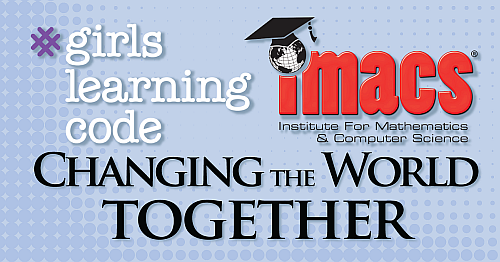 Ladies Learning Code and the Institute for Mathematics and Computer Science (IMACS) are partnering to award over $3,000 in scholarships to participants in the 2016 Girls Learning Code Camps and members of GLC’s Teen:Club. The two full and three half scholarships will allow recipients to enroll in IMACS’ introductory computer science course, University Computer Science I (UCS1). Shuli Jones attended the very first Girls Learning Code camp as a 6th grader back in 2012 where she won a half scholarship to UCS1. She is now a sophomore in high school and recently scored a ‘5’ on the AP Computer Science A exam as a freshman. Since starting IMACS’ computer science courses soon after the camp, Shuli has been one of IMACS’ top CS students. IMACS will award the other full scholarship and two half scholarships to members of GLC’s Teen:Club. In Teen:Club, 13 to 17 year old girls focus on solving problems, turning ideas into reality and learning about what a future in technology could look like. All members are invited to apply. "Now that we have been running youth programs for 4 years, we are really starting to see our participants move on to technical career paths, pursuing Computer Science in University and coming back to participate in our programs as mentors, inspiring the next generation of girls," says Laura Plant of Ladies Learning Code. "We’re excited for our girls to have an opportunity to study computer science at a high level with IMACS." Ladies Learning Code is a Canada-wide not-for-profit organization that runs workshops for women and youth who want to learn beginner-friendly computer programming and other technical skills in a social and collaborative way. Today they have 22 chapters (and counting) across Canada, a thriving girls’ program called Girls Learning Code and co-ed kids program called Kids Learning Code. With sponsors and community partners that include TELUS, Microsoft, Facebook, Autodesk, Google and many more, Ladies Learning Code has become synonymous with technology education in Canada. Founded in 1993 by a team of mathematicians, computer scientists and educators, IMACS offers talented middle and high school students a range of online courses in university-level mathematics and computer science that are recognized by many prestigious universities. IMACS also offers math and computer enrichment classes at its US centers in Florida, North Carolina, Missouri, and Connecticut. Over 4,500 students throughout the US and the world attend local IMACS classes or study its online courses. For more information on IMACS visit www.imacs.org. Logical thinking can be learned at a young age with engaging games and puzzles. Logic is the systematic study of reasoned argument. Why study logic? For students planning to take university-level math courses, which typically involve reading and writing proofs, the benefits are evident. But even for students heading in a different direction, developing strong logical reasoning skills has benefits too. Few would dispute that arithmetic is a fundamental base upon which the successful learning of math is built. Consequently, the development of arithmetic skills receives enormous attention in elementary school. 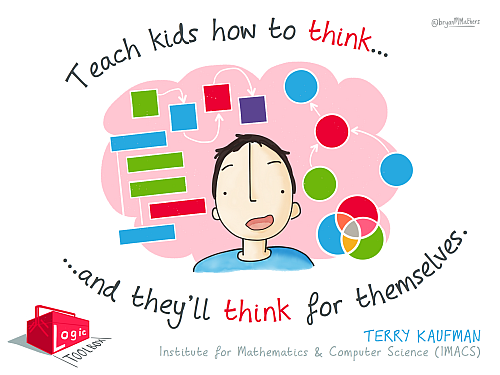 Logic is equally fundamental to learning all other areas of math but is rarely taught in elementary school. 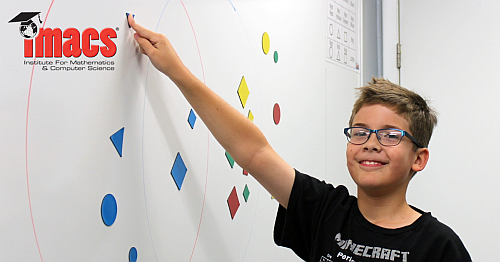 Were students to develop a strong foundation in logic at a young age, their capacity to understand middle and high school math would be greatly enhanced. In arithmetic, we learn how to combine or break apart numbers in order to proceed from the information given to the answer sought. If we bake three dozen cookies, multiplication tells us how many cookies we have in all. If 17 cookies are left, subtraction tells us how many were eaten. Honing arithmetic skills in elementary school allows students to quickly and accurately call upon them later, thereby making it is easier to learn more advanced math in the future. Logic is a similarly powerful and essential tool for learning more advanced math. Whereas arithmetic is used in constructing and deconstructing information that is numeric in nature, logic is essential in constructing and deconstructing assertions that are mathematical in nature. Students typically encounter a weak version of proofs and logic for the first time in high school geometry. But by then, pre-algebra and elementary algebra have already been taught as mostly procedural rules and algorithms to accept at face value. As a result students do not develop a genuine understanding of the derivation of those rules and algorithms and why they work. By the time students reach high school, their natural curiosity about mathematical ideas has been reduced to a hard-to-break habit of memorizing and applying rules blindly. A worthy goal of the Common Core math standards is to develop mathematical understanding in addition to procedural skills. True mathematical understanding comes with seeing how knowledge is pieced together step-by-step on the path to deriving an important result. This is similar to what we know about developing scientific understanding in young minds — hands-on projects make learning stick better than memorizing facts. Math’s version of "hands-on" is your brain working its way through the reasoning that mathematicians followed in order to provide us with neat and tidy rules. With a strong foundation in logical reasoning, students would have the key analytical tool needed to work their way successfully through the reasoned arguments that lead to the rules. Some may even wish to achieve the deepest understanding by using logic to independently derive the mathematical truths they were once asked only to memorize. The solution may be found in the Notes section of the IMACS Facebook page. The amazing thing about logic is that it makes us better thinkers and problem solvers well beyond mathematics. Computer science could not exist without logic. If you want to understand the underlying principles and algorithms and be able to apply them in any programming environment, you must understand logic. Engineering disciplines rely on logic too, especially electrical engineering as any Minecrafter worth her redstone will tell you. The entire practice of law is founded upon reasoned argument, which is why the LSAT has sections on logical reasoning and analytical reasoning. People who learn to think logically are better at analyzing complex problems. Mathematics, with its diversity of complex problems, is a natural thought playground for developing logical thinking skills. The first steps in solving any math problem are assessing the situation and coming up with a plan of attack. Can you view the larger problem as a combination of more manageable cases? Can you take what you know and derive what you need to know? Would additional information lead you to certain conclusions? Answering these types of questions requires logical thinking. People who learn to think logically are also better at assembling solutions. Once you have assessed the problem, broken it down, and gathered the necessary information, how do you put it all together to arrive at a solution? When faced with a novel situation, can you devise an approach where there was not one before? As the pace of change in our world accelerates, every field increasingly needs people who can strongly grasp core concepts and combine them sensibly to solve any problem, especially unfamiliar ones. 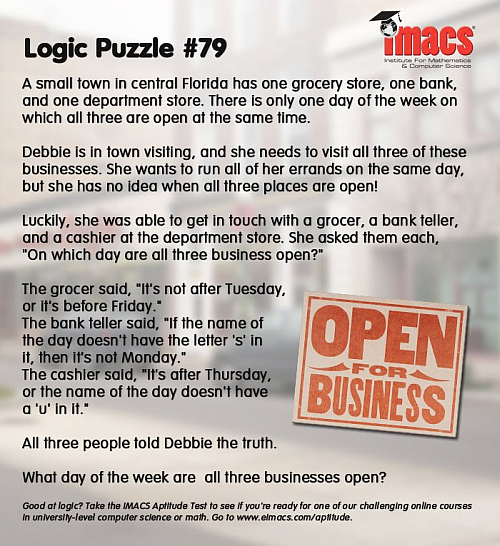 Learning to apply logical thinking to mathematical situations is excellent training for handling complex problems, no matter which college major or career you choose. Logic has a way of promoting clarity of thought in understanding ideas that were previously unfocused or muddled. Whether you are planning on becoming a professional mathematician or just trying to get through math homework on your way to a different intellectually demanding career, there is no doubt that strong logical reasoning skills would ease your path. This blog article is part of the Hoagies' Gifted Education Page March 2016 Blog Hop on Math Education Enrichment. Please click on the Blog Hop image above to learn more about Math Education Enrichment from other Hoagies' Blog Hop participants.